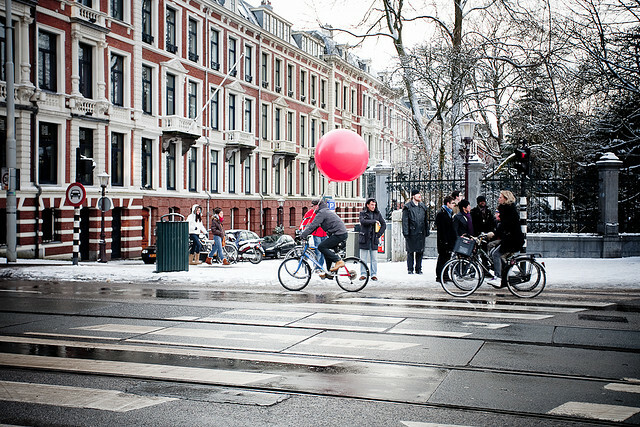 Even in cold weather, Amsterdam has a successful biking culture, proving that climate does not always deter cyclists. Photo by Bauke Karel. Biking and walking infrastructure is often evaluated from the point of view of the planners. To get more public input on these topics, the Mineta Transportation Institute recently published “Integration of Biking and Walking Infrastructure into Urban Communities,” led by Cornelius Nuworsoo, Eugene Jud and Katherine Cushing. In general, a perfect climate or geography does not always mean an increase in cycling. San Luis Obispo, for example, has very steep hills along main corridors. Copenhagen and Amsterdam, are very cold. All of these locations, however, have a high cycling mode share. Some important factors for cyclists, beyond infrastructure, are the presence of a supportive bike culture and bike education. Even in a city like Davis, which is flat, has a good climate, and has many biking facilities, bike mode share went down for a number of years until a concerted bike campaign effort was put into place. I was also surprised to find—because it often seems dangerous—that people generally prefer to use bike lanes on major roads. People are also willing to walk and bike longer than planners generally assume. While aesthetics along a route sometimes get more focus from planners, they are actually secondary considerations for everyday users. These findings show that in places of high biking and walking mode share, people use these modes just as they would use cars in a high car mode share area. Distance to key destinations, connection and lack of barriers matter the most for everyday users. These are the main issues planners need to address to increase biking and walking. Though this report studied three university towns, which tend to have relatively high rates of walking and cycling, the findings from this study still provide lessons for all cities. Universities in California generally must balance their high traffic demand and limited space for expansion with maintaining an attractive campus where students will choose to attend. Though campuses often have complete ownership over campus planning, cities are also involved in the effort to ensure cohesive decision-making. Though university towns may have unique circumstances that increase cycling, every city can develop cycling campaigns and educational programs. These are some of the points I found interesting during the research. There are many more findings and photos of innovative practices in the report. For more information contact me at ecooper@wri.org. Do Bikes Build a Better City?